Organize, occupy and fight injustice. 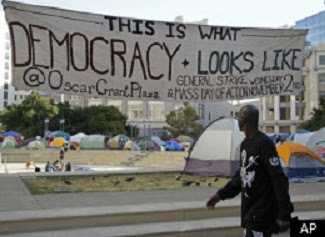 I hope to be speaking at an Occupy event this weekend. Below is a copy of the speech I hope to present. In case I'm not given the okay to deliver it there I'm posting it here. Comments are welcome. I'd like to begin by reading a passage from, The Grapes of Wrath, a book written in 1939 by John Steinbeck. These words were spoken as a warning to the bankers and financial institutions of his day and are no less a warning to the bankers and financial institutions of our own time. And in the night one family camps in a ditch and another family pulls in and the tents come out. The two men squat on their hams and the women and children listen. Here is the node, you who hate change and fear revolution. Keep these two squatting men apart; make them hate, fear, suspect each other. Here is the anlage of the thing you fear. This is the zygote. For here "I lost my home" is changed; a cell is split and from its splitting grows the thing you hate—"We lost our home." The danger is here, for two men are not as lonely and perplexed as one. And from this first "we" there grows a still more dangerous thing: "I have a little food" plus "I have none." If from this problem the sum is "We have a little food," the thing is on its way, the movement has direction. Only a little multiplication now, and this land, this home are ours. The two men squatting in a ditch, the little fire, the side-meat stewing in a single pot, the silent, stone-eyed women; behind, the children listening with their souls to words their minds do not understand. The night draws down. The baby has a cold. Here, take this blanket. It's wool. It was my mother's blanket—take it for the baby. This is the thing to bomb. This is the beginning—from "I" to "we." If you who own the things people must have could understand this, you might preserve yourself. If you could separate causes from results, if you could know that Paine, Marx, Jefferson, Lenin, were results, not causes, you might survive. But that you cannot know. For the quality of owning freezes you forever into "I," and cuts you off forever from the "we." We cannot be stopped if we stand up for what is right and true. And what is the truth? The truth is not that these institutions are too big and too important to be allowed to fail. The truth is that these institutions have become too big, too corrupt and too greedy to be allowed to succeed. The truth is not that this is a Conservative or Liberal problem, nor is it a black problem, a white problem or an immigration problem. The truth is that all of us are victims of the real problem, corporate greed. All of us are being exploited by evil men who feel there is no higher power to answer to than stockholders. Wealth and the accumulation of it at any cost to anyone else is their sole aim in life and the truth is that this belief is extremely detrimental to the promotion of life and is as a matter of fact destroying life in communities around the entire world. Enough is enough! It is time to put a stop to these evil men and their economic philosophy of greed and excess and reclaim our humanity, our dignity, our hopes and our dreams of making a better tomorrow for the children in our care. Anger is not enough. Protest is not enough. Only by laying siege to the ivory towers of greed and exploitation and demanding justice for their crimes against humanity instead of allowing them more bailouts and higher banking fees will we finally make these profiteers accountable for their actions. And I say that not even this is enough. Not only must we organize and occupy, we also need to deluge Washington with a tidal wave of letters telling those who stand in the way of our prosperity that we do want the green jobs President Obama is trying to bring to this country We do want to rebuild the roads and bridges that will carry our families into the future and yes, we do want to rebuild the power grids that will lead to a brighter and greener tomorrow. Fossil fuels and the automobile industries are no longer the path to a better future. They've carried us as far towards tomorrow as they can and the new vehicles towards a better day are solar panels, wind mills and transportation systems that are eco-friendly instead of environmentally destructive. Tell those who stand in the way of progress that we do want the green jobs that will inspire us, invigorate us and return to us a sense of dignity in the knowing that our efforts are indeed building a better future for our children. I know the crowd here today may appear small, but let me assure you that our voices are now part of a larger chorus that is at this very moment being heard loud and clear around the entire world, “We're sick and tired of sitting around our little campfires talking about all the things we've lost to the bankers and the fat cats living it up on Wall Street and we're not going to take it anymore!” The time for this generation's multiplication has come. It is now our time to stand up together and fight against the greatest evil of our day, corporate greed. Thank you to the organizers of this event today for allowing me to speak and thank all of you for listening to the words of a tired old man. I can not say this with any more energy, organize, occupy and deluge Washington with your letters demanding a better future, not after the next election, but right now. Take a stand and take action. Thank you. DirkStar, Wednesday, November 02, 2011 1 Tie-Dyed Hippies.